What on earth had just happened to me? It was a plant, for heaven's sake! And with the exception of the bright yellow blooms, it looked more like a weed than anything you would purposely put in a garden. But this mysterious plant had captivated me, and I couldn't wait to tell the others what I had seen. Chris's life is anything but peaceful when she returns to Carraugus County to clean out her deceased grandmother's home. But her life changes forever when an Amish woman invites her to watch a moonflower open. Chris never would have believed that a simple plant could lead her on such a remarkable journey -- a journey that would remind her of truths she had long ago forgotten. Conversations with a Moonflower is a short, but thoroughly thought provoking read. The story of Christine and her flowers was fun and interesting. The very best part though was the further I got into the book, the more I found myself pausing after chapters to think about moments in my life when I had similar feelings, how I grew to be who I am today, and what events in my life led me to where I am. Or I would stop in the middle of a chapter and just think about a statement that had just been made - and just how much I loved it. Conversations with a Moonflower may be a little book, but it makes a huge impact on the reader. I highly recommend it! 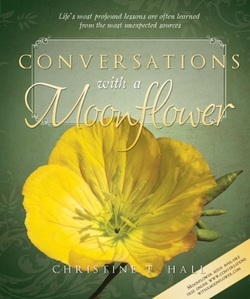 Purchase your copy of Conversations with a Moonflower at Amazon.com, Deseret Book, or Barnes and Noble.